Location in Erie County and the state of New York. Evans is a town in Erie County, New York, United States. The population was 16,356 at the 2010 census. The town derives its name from David E. Evans, an agent of the Holland Land Company and nephew of land agent Joseph Ellicott. Evans is south of Buffalo in the southwest corner of the Erie County along the coast of Lake Erie. The town of Evans was established in 1821 from part of the town of Eden. The first settler arrived around 1804, but there was no permanent settlement until 1808. David Evans was named the local agent of the Holland Land Company in 1827. He was known for his humane management of the company business in relation to the impoverished settlers. According to the United States Census Bureau, the town has a total area of 41.56 square miles (107.64 km2), of which 41.53 square miles (107.56 km2) is land and 0.031 square miles (0.08 km2), or 0.08%, is water. 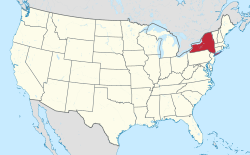 The New York State Thruway (Interstate 90), US 20 (Southwestern Boulevard), and NY 5 (Erie Road) pass through the town. The north town line is defined by Eighteen Mile Creek, which is well known for excellent fossil formations. The town of Brant is to the south, Hamburg is to the northeast, and the town of Eden is to the east. As of the census of 2000, there were 14,070 people, 6,639 households, and 4,773 families residing in the town. The population density was 420.5 people per square mile (162.3/km²). There were 7,507 housing units at an average density of 179.4 per square mile (69.3/km²). The racial makeup of the town was 97.81% White, 0.38% African American, 0.62% Native American, 0.20% Asian, 0.02% Pacific Islander, 0.19% from other races, and 0.78% from two or more races. Hispanic or Latino of any race were 1.20% of the population. There were 6,639 households out of which 34.8% had children under the age of 18 living with them, 56.4% were married couples living together, 11.0% had a female householder with no husband present, and 28.1% were non-families. 23.5% of all households were made up of individuals and 10.1% had someone living alone who was 65 years of age or older. The average household size was 2.63 and the average family size was 3.11. In the town, the population was spread out with 26.3% under the age of 18, 6.8% from 18 to 24, 29.4% from 25 to 44, 25.2% from 45 to 64, and 12.3% who were 65 years of age or older. The median age was 38 years. For every 100 females, there were 95.3 males. For every 100 females age 18 and over, there were 92.3 males. The median income for a household in the town was $43,142, and the median income for a family was $50,765. Males had a median income of $39,022 versus $26,698 for females. The per capita income for the town was $19,122. About 5.4% of families and 7.0% of the population were below the poverty line, including 8.8% of those under age 18 and 5.3% of those age 65 or over. Angola – A village in the south part of the town. Angola Lake Shore Addition – A community in the southwest part of the town. Angola on the Lake – A lakeside community by Lake Erie. Bennett Beach – A lakeside park west of Evans Center. Camp Lakeland – A lakeside community by Lake Erie. Camp Pioneer – A lakeside community by Lake Erie. Derby – A hamlet in the northwestern part of the town. Evans Beach Park – A hamlet on the lake shore west of Angola. Evans Center – A hamlet on NY-5 north of Angola. Evangola State Park – A small part of the state park is at the town's south line. Grandview Bay – A lakeside hamlet west of Angola. Highland on the Lake – A lakeside hamlet on NY-5. Jerusalem Corners – A hamlet in the western part of the town. Lake Erie Beach – A lakeside hamlet southwest of Angola. North Evans – A hamlet in the northeastern corner of the town. Pontiac – A location near the eastern town line. Wendt Beach Park – A lakeside park north of Camp Lakeland. West Beach Park – A lakeside park in the northwest part of the town. ^ a b "Geographic Identifiers: 2010 Demographic Profile Data (G001): Evans town, Erie County, New York". U.S. Census Bureau, American Factfinder. Retrieved March 28, 2013. ^ "Eighteen Mile Creek". ClassicBuffalo.com. Archived from the original on May 27, 2006. Retrieved March 28, 2013. This page was last edited on 15 August 2018, at 15:50 (UTC).